Things are not going too bad in local politics in Iraq: As of this week, all governorates that held provincial elections on 20 April have formed new local governments following certification of the final results in late May – hence more or less on time and in accordance with the legal framework. During the past few days, on top of the councils that were formed last week, new local governments have been seated in Karbala, Muthanna and Diyala. As with the first batch of new governorate councils, a variety og government-formation dynamics prevailed in the last three councils. Karbala saw the emergence of a “political majority” government led by the State of Law alliance of Prime Minister Nuri al-Maliki and various local blocs including that of the sensation from the 2009 elections, Yusuf al-Hububi. The Sadrists and ISCI remained on the sidelines. Conversely, in Muthanna, Maliki’s allies cut a deal with ISCI to keep the governor position for themselves whereas an ISCI politician became council speaker. Finally, Diyala saw a particularly interesting deal whereby Kurds and a local Iraqiyya list formed the government with the support of the Sadrists – but not the other Shiites with whom they had run on a joint pan-Shiite ticket (mainly State of Law councillors including several from Badr and Fadila). Beyond the broad three-way classification of “consensus” and “political majority” (pro-Maliki and anti-Maliki), there are further nuances in this picture. For example, in Basra, ISCI in principle held the votes to exclude Maliki and more or less dictated the terms whereby the popular governor from Maliki’s list was given the consolation prize of the council speakership. In Maysan, perhaps the governorship given to the Sadrists more than anything reflects a longstanding association between the Sadrists and that governorate. In sum, the outcome of the local government formation is a mixed bag for Maliki. He keeps control of the shrine cities of Najaf and Karbala and consolidates his position in Mid-Euphrates governorates where ISCI was formerly strong. On the other hand, the loss of Baghdad and Basra must be painful, and with additional marginalisation experienced in Wasit and Diyala there should be plenty to think about as the parliamentary elections of 2014 approach. Meanwhile, delayed elections for local councils in Anbar and Nineveh are being held today. Much is a stake in an area that is sandwiched between rising Sunni militancy in neighbouring Syria and a Baghdad government with which attempts at rapprochement have so far been quite ambiguous. Provisional results should be expected next week. Since the final results of the Iraqi local elections were certified in late May, Iraqi local politicians have moved with reasonable speed towards forming new councils and appointing new governors. There has been much speculation about the way alliances are shaping up, but as of today, 8 out of 12 provinces that held elections on 20 April have actually completed the formalities of establishing new local governments. In an echo of what happened in 2009, coalition formation has been a process full of surprises and not always in line with the most obvious predictions that emerged from the results themselves. Generally speaking, there has been a tendency of Prime Minister Nuri al-Maliki’s own concept of a “political majority” being employed against him, mostly after fellow Shiites from ISCI and the Sadrists decided to join forces to challenge his dominance in several provinces. Often these political majorities are based on little else than strong personal enmity towards Maliki and his State of Law Alliance, but this sentiment has proved sufficient to create anti-Maliki coalitions in some, if not all, the Shiite-majority governorates. Perhaps the best way to typologise the new local governments is to sort them according to the level of conflict between the main blocs in settling the governorships and other top positions (of which the speakership is the most important). First, there are consensus-based governorates where the Sadrist-ISCI deal at the national level gave way to local agreements and did not succeed in marginalising Maliki completely. These include Basra (ISCI governor, State of Law speaker), Maysan (Sadrist governor, State of Law speaker), Qadisiyya (Fadila governor, ISCI speaker). In Basra, the competition started out as a ISCI-Sadr coalition but Maliki’s State of Law eventually agreed to take the speakership, perhaps as a face-saving mechanism. It is a remarkable outcome that ISCI with only 6 seats won the governor position, and that the previous pro-Maliki governor – perhaps one of Iraq’s most popular politicians with more than 130,000 personal votes – was demoted to the speakership position. For its part, Maysan has seen Shiite grand coalitions before and the Sadrists simply retain their pre-eminent position, whereas the emergence of a pan-Shiite consensus government in previously contested Qadisiyya is a new phenomenon. Second, there are competitive governorates. These include Najaf (local parties backed by State of Law in both top positions), Wasit (ISCI governor/Sadrist speaker), Baghdad (Sadrist governor/Mutahiddun speaker) and Dhi Qar (State of Law in both top positions). In these governorates, the votes on new government were characterised by boycotts and loud protests by the losers, highlighting the extent to which competition among the Shiite parties remains intense. 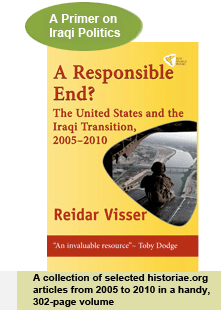 The Baghdad outcome – where Maliki’s candidates also received a strong popular mandate in the shape of personal votes and a large number of seats – is another particularly interesting example that ISCI and the Sadrists are prepared to go to lengths to challenge Maliki. The inclusion of the Sunni-secular Mutahhidun bloc of parliament speaker Usama al-Nujayfi makes the development even more interesting in that it approximates the logic that has sometimes manifested itself at the national level in challenges to Maliki’s premiership. Conversely, though, there is the example of the Sunni-majority Salahaddin – one of the first governorates to elect a new government after the latest elections – where a governor from a local bloc with a reasonably good relationship to Maliki was confirmed in power despite challenges from more anti-Maliki forces in the various Iraqiyya factions. So far, it seems ISCI in particular is finding back to the dexterity in coalition-building that characterised the party in 2005, when relatively modest electoral performance was translated into massive political influence through key positions in local government. 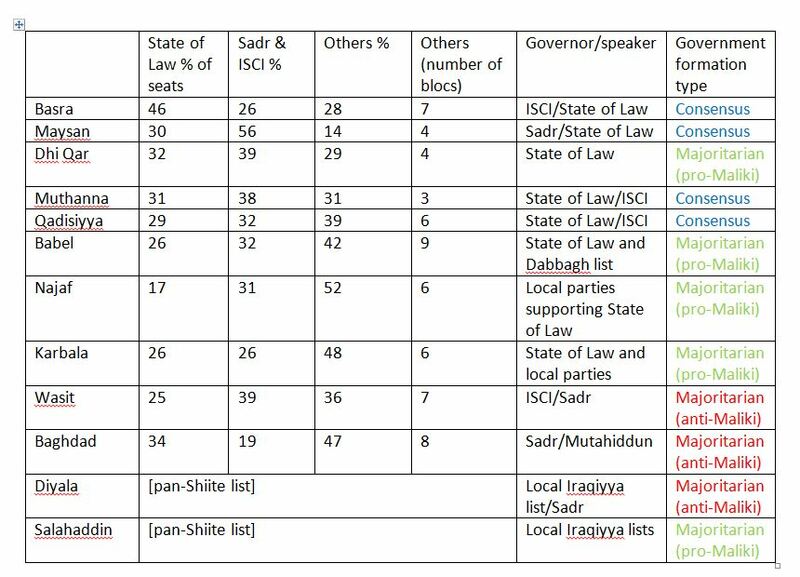 That said, ISCI was also the party that got most heavily punished at the next local and national elections (2009 and 2010 respectively), meaning it may not be the biggest catastrophe for Maliki to have fewer incumbent governors come parliamentary elections time in 2014. Perhaps more crucial to the future of his premiership will be the outcome of delayed local elections in Anbar and Nineveh who vote on Thursday 20 June. Here, given the Sunni majorities, Maliki’s stakes are more indirect. However, the extent to which Sunni radicalism prospers in these areas as a spillover from the Syria conflict may be a key factor in Maliki’s chances of forming a viable electoral coalition for 2014.